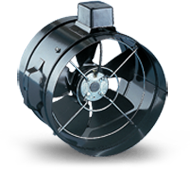 The Minitube Series of duct mounted axial fans is suitable for domestic, commercial and industrial ventilation applications. Available in 5 sizes ranging from 150 to 350mm diameter. They can be supplied with plastic housings from 200 to 300mm diameter and metal from 150 to 350mm diameter. Exhausting or supplying air to applications handling clean ambient air. Plastic version is suited to domestic and commercial installations such as apartments, hotels, gymnasiums, schools and shopping centres. Steel version provides a robust alternative for commercial and industrial applications. Choice of two light-weight but robust housing materials, metal or injection moulded plastic. Available in a range of speeds. MTP range matches 150mm, 200mm, 250mm and 300mm standard duct sizes. An extensive range of matching ancillary equipment is available.